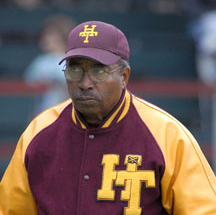 (AUSTIN, Texas) 3.13.15 — Huston-Tillotson University’s Baseball Coach, Alvin E. Moore, suffered a heart attack prior to the Friday, March 6, game at Downs Field. Moore is currently resting comfortably at a local hospital after spending several days in the intensive care unit. Moore earned his Bachelor of Arts degree from HT in 1973. This year marks his 34th year as the head baseball coach since joining the HT staff in 1981. Moore has also served as the Intercollegiate Athletics Director and Business Manager, responsible for men’s and women’s soccer, track and field, basketball; women’s cross country, softball, and volleyball, and baseball . He has collected more than 600 wins during his career while serving as a mentor to hundreds of athletes. His athletes have been drafted by the Atlanta Braves, Cincinnati Reds, Cleveland Indians, Houston Astros, Kansas City Royals, Los Angeles Dodges, New York Mets, and the Texas Rangers. Moore was featured in a local production, “District Days at Historic Downs Field,” as part of a community-wide celebration of culture, legacy, and baseball. He is passionate about the upkeep of Downs Field that is home to the HT Rams baseball team. Downs Field, designated as a historic landmark by the Texas Historical Commission, was named in honor of Dr. Karl E. Downs, president of Samuel Huston College from 1943 to 1948. The field is also home to the Austin Metro Baseball League. The Rams baseball team is continuing play this season under volunteer coaches Jimmie Nauman, and Austin Levelle.